A sensitivity variable is an input variable for which multiple values can be specified. HOMER performs a separate optimization procedure for each specified value. For an explanation of why you do this, see Why Would I Do a Sensitivity Analysis? It is easy to specify multiple values for an input variable. All variables for which multiple values can be specified have a sensitivity button ( ) beside them. 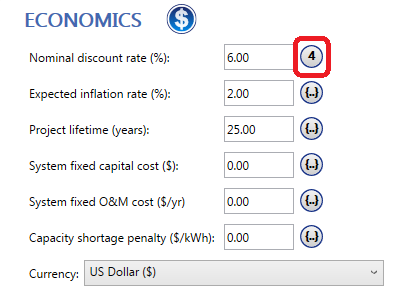 The sensitivity button for the Annual Real Discount Rate is shown below next to the input field. To specify multiple values, click the sensitivity button and enter any number of values in the sensitivity values window. The values do not have to be evenly spaced, and you can enter them in any order. If there are other sensitivity variables, they are listed in the Linked with: drop-down menu. By selecting one of these variables, you can perform a sensitivity link. When you click OK, the sensitivity button displays the number of values specified for the variable. For capital, replacement, and O&M cost variables, rather than performing a sensitivity analysis directly on these costs, a multiplier variable scales these values. If, for example, you enter a PV Capital of $1000/kW, the Capital Cost Multipliers of 3, 4, and 5 correspond to effective PV Capital Costs of $3000/kW, $4000/kW, and $5000/kW. For variables specified in the component Costs tables, the sensitivity concept is slightly different. Inputs like the Initial capital cost are not defined by a single value, but by a column in the component Costs table. There can be one or more values in the column. For each of these variables, you can click the sensitivity button below the appropriate table column to access a multiplier variable. The Costs table and sensitivity buttons for the initial capital cost, replacement cost, and O&M cost are shown below. Because you can enter several values for the multiplier variables, you can perform a sensitivity analysis on any column. The multiplier simply scales the whole column up or down. You can edit the first value in the sensitivity table for a multiplier variable. You cannot do this with normal sensitivity values, where the first value in the sensitivity table is the value entered in the corresponding sensitivity window. HOMER designs an optimal hybrid system for each sensitivity case.